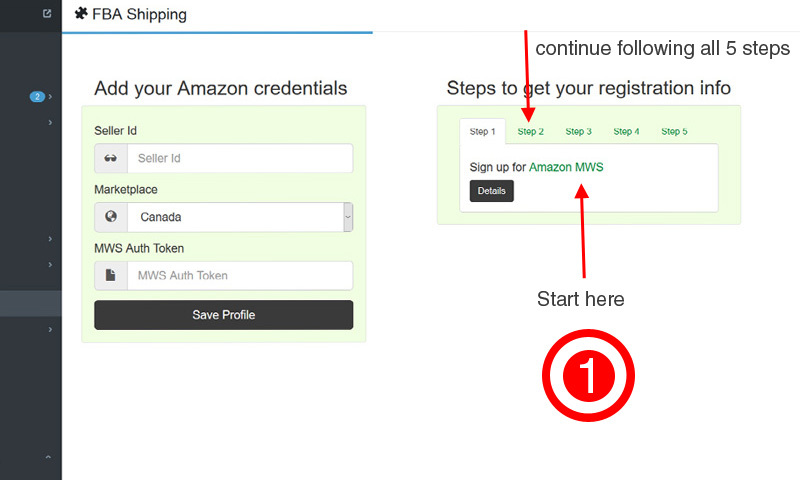 How do I retrieve my Amazon credentials? There are instructions right next to where you enter your credentials, but we’ve also included some pretty pictures below. Just follow these steps and in less than 5 minutes you’ll be up and running. How do I enter my shipping methods? This is where you determine what you will charge your customers for which shipping speeds. You can pass along all of the shipping fees, discount them, charge a flat rate, or offer free shipping. IMPORTANT: Amazon will only fulfill orders that use their shipping rates. So be sure to set up your shipping rates in the app, rather than directly in BigCommerce. Rates not set up in the app will not be accepted by Amazon. We’ve explained the fields below, but please make sure to save each tab. Otherwise your settings will not be saved. Enable flex rate shipping if you want to pass on Amazon’s dynamic rates to your customers. You can enter an amount above (positive) or below (negative) the total fees Amazon will charge you to fulfill an order. If you don’t enter anything, the customer will be charged the same amount you will be charged by Amazon to fulfill their order. Enable flat rate shipping if you want to charge a set shipping rate for all orders. Select this box to offer free shipping. Enter the total cart amount the user will need to purchase in order to receive free shipping for this specific shipping speed. If you enter nothing, they will be offered free shipping on any purchase amount. Finally, you need to save your updates for each shipping speed. Not just one save for all shipping speeds. Amazon will not ship your product to the desired destination. This varies product to product and is determined at the whim of Amazon. Make sure to check that your item ships to the destination. Make sure the SKU on BigCommerce matches your SKU on Amazon. They have to match, and if they don’t we cannot get shipping rates for you. I wish we could provide a warning message on the checkout page, but there currently isn’t a way to do this on the BigCommerce platform. Why is only one shipping speed showing up? Amazon only provides one shipping speed, Standard, when shipping between countries in the EU.